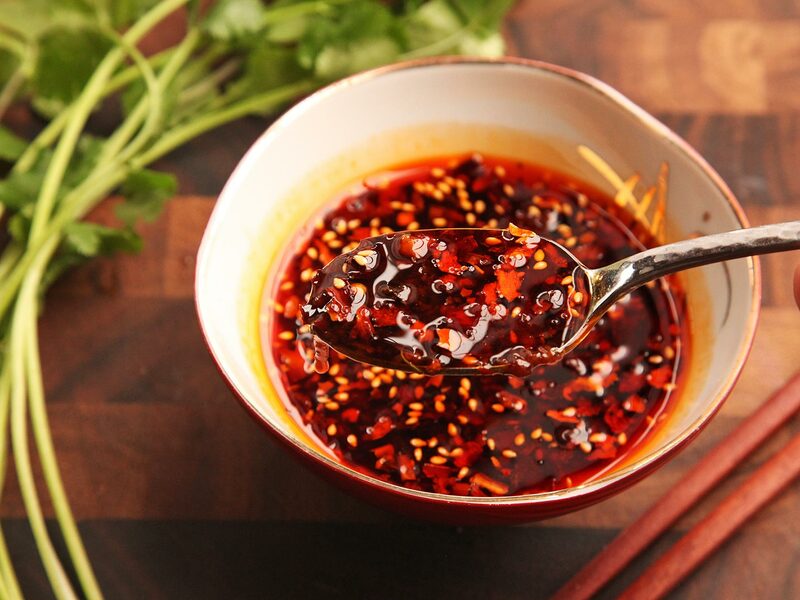 Making chili oil at home might seem like a daunting task at first, but once you understand the key steps, it only takes five minutes to make the best tasting chili oil full of fragrance, nuttiness and smokiness! Combine chili flakes, five spice powder, sesame seeds, star anise, Sichuan peppercorns, and bay leaves in a heatproof ceramic bowl. 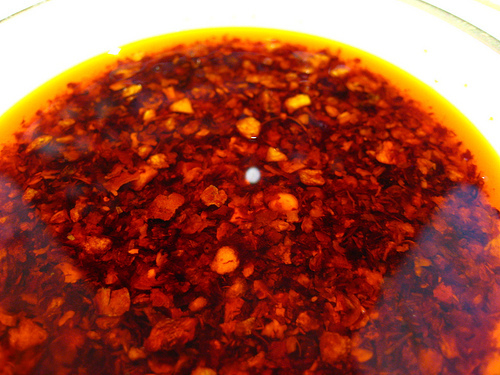 Heat oil in a wok over medium-high heat. Add ginger. When the ginger starts to wither and turns golden brown, immediately turn off the heat. Carefully pour oil into the bowl of mixed spices. The oil will bubble for a few seconds and cook the spices. While the the oil is bubbling, use a metal spoon to stir gently to mix the spices, so they’ll cook thoroughly. When the oil cools down a bit, scoop out and discard the star anise, ginger and bay leaf. The oil is now ready to use! Its flavor will mature if you let it rest for a day, allowing the spices to infuse into the oil. The oil can be stored covered at room temperature for two weeks, or up to six months in the fridge in an airtight container. Tags: chilli, oil. Bookmark the permalink.